(Preface): On January 1, 1862, Confederate Gen. Thomas J. "Stonewall" Jackson led four brigades west from Winchester, Va., to secure Romney in the fertile South Branch Valley on the North Western Turnpike. He attacked and occupied Bath on January 4 and shelled Hancock, Md. ; he marched into Romney on January 14. Despite atrocious winter weather, Jackson's men destroyed telegraph lines and 100 miles of Baltimore and Ohio Railroad track. Leaving Gen. William W. Loring's brigades in Romney, Jackson led the Stonewall Brigade back to Winchester on January 23. Loring followed on January 31, and the Federals reoccupied Romney on February 7. Artillery fire, sharp skirmishing, and the difficulty of maneuvering in the snow delayed the Confederate advance for hours. Hoping to capture the Federal garrison, Jackson deployed units to outflank the town while the main body advanced down the road into Bath. Snow and determined resistance delayed his complicated battle plan. The first Confederate casualty may have been Pvt. William Sybert, 48th Virginia Infantry, who fell in the snow and broke his ankle. The 39th Illinois broke contact shortly before 2:00 P.M. and escaped to Sir Johns Run and Hancock. Jackson pressed on, attacking other companies of the 39th Illinois at Great Cacapon, Sir Johns Run, and Alpine opposite Hancock, but garnering few prisoners. 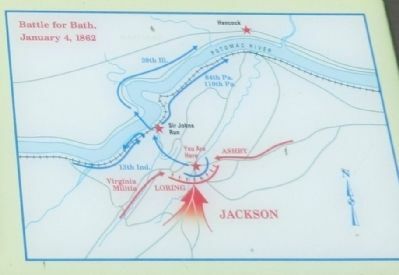 With the Federals pushed across the Potomac River, Jackson could now march west to Romney. Location. 39° 37.602′ N, 78° 13.644′ W. Marker is in Berkeley Springs, West Virginia, in Morgan County. Marker is at the intersection of Fairfax Street and Washington Street (West Virginia Highway 9) on Fairfax Street. Touch for map. Marker is at or near this postal address: 90 Fairfax Street, Berkeley Springs WV 25411, United States of America. Touch for directions. Other nearby markers. At least 8 other markers are within walking distance of this marker. Morgan County Veteran's Monument (a few steps from this marker); Campaign in the Snow (a few steps from this marker); The Sons and Daughters of Morgan County (a few steps from this marker); Berkeley Springs / James Rumsey (a few steps from this marker); William Herbert / Dr. John Meade Travers (within shouting distance of this marker); Frederick Conrad / Robert Rutherford (within shouting distance of this marker); James Muir (within shouting distance of this marker); William Ramsey and James Stuart (within shouting distance of this marker). Touch for a list and map of all markers in Berkeley Springs. More. 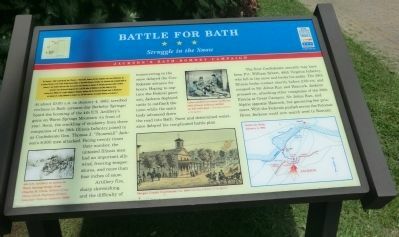 Search the internet for Battle for Bath. Credits. This page was last revised on June 16, 2016. This page originally submitted on August 22, 2012, by Don Morfe of Baltimore, Maryland. This page has been viewed 588 times since then and 14 times this year. Photos: 1. submitted on August 22, 2012, by Don Morfe of Baltimore, Maryland. 2. submitted on September 10, 2012, by Don Morfe of Baltimore, Maryland. • Craig Swain was the editor who published this page.